"After over ten years in film and television, I'm working in a gaming pipeline for the first time at Next Level Games, helping previs & animate in-engine cutscenes. Switching pipelines like this is a terrific brain-scramble, the crew is fantastic, and it's a ton of fun being surrounded by Nintendo IP all day. It's making me want a WiiU. Is that weird? Yes, it is. But here we are. " After ten years of film and TV, I'm insanely excited to finally scratch my itch to contribute to the gaming world! Responsible for working with animation and gameplay teams to create in game, in engine cinematics for an upcoming Nintendo IP, from concept to completion. What the Wii is wierd about wanting a Wii U? Holy crap this industry stigma is ridiculous. 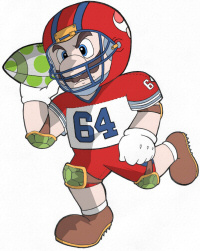 be cool if they made that Mario Football game Retro almost made before Metroid Prime. I think some sort of sports title with Mario and characters would be a great addition to the Wii U. These animations are very astonishing and they were done back in 2000-2001. I think this game will have a 2016 release, we will also have word on Metroid for 2016, and animal crossing for 2016.. So, little magician, do you have any other tricks up your sleeve? Depends what you are talking about? Are you referring to my guesses for 2016? I think they are indeed making a Wii U game but i don't see anything special about that remark. It's alright, I always wanted to say that to you. Anyways, some people were saying this might be a new IP from Next Level but I didn't take the info as that. Guess we will find out in a few months. On topic, obviously wouldn't mind Luigi's Mansion 3. I'd appreciate it if they would bring back portrait ghosts. I am not a fan of their style in the metroid concept art.. from a little while back. Either way I am pretty sure we'll see a Metorid for Wii U and 3DS announced at e3, for 2016 release. I'm not really much of a fan of that artstyle myself, looks like something straight out of cartoon network lol. I'm really hoping we get another Retro developed Metroid though next year, with a 2d entry this fall on the 3ds looking at the gaping hole in release schedule. If Next Level is in fact doing a Wii U game I'd like to see something different for a change. Perhaps a Wario title or Takamuras Ninja Castle, anything really. Wonderflick. They are releasing it for Xbox,Wii U,PS4 and ios so likely just taking time to port it to all systems smoothly.